In the early Spring, we began boxing up things which we didn't use often or probably could have done without: books; VHS tapes; odd tools; some collectable items, etc. Eventually between stacks of packaging materials and packed boxes, the garage was a shambles. But the inside of the house was beautifully staged and the house was sold in 30 days. Once the buyer was reasonably certain, packing began in earnest. Boxes began to be stacked to the ceiling in several rooms. Work, work, work. Tired, tired, tired. Guess what. We're not 20 years old anymore. We hired our housekeeper, Maria, for a couple of extra days so at least there were three of us working. Pack, pack, pack. Hardly a dent. 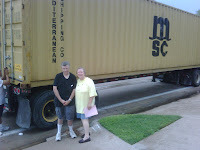 We were both packing as hard as we could, all through June, with the exception of a motor trip to see the Grand Canyon. Back to Houston and pack, pack, pack. Quick, 24 hour trip to Thibodaux, LA., for a last pre-move visit with that part of the family and back to Houston. Pack, pack, pack. By the 4th of July holiday, there was sheer desperation in our hearts. 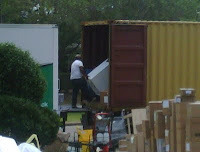 The container was coming on the 6th, in the morning and we were only allowed 3 hours to put everything into it. Still all of the big heavy stuff was unpackaged and unprotected for moving. We weren't going to make it. 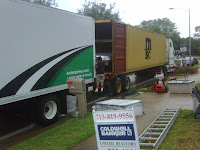 After a horrid experience with 2-Men Movers telling us they could help but then backing out, on the 5th, we hired some "professional" movers to help us get the last of our stuff packed to be ready (allegedly) to load into the container on the 6th. To be certain that the new team wouldn't back out, I sent their office a highly detailed inventory of the big things they'd have to pack, "Plus the typical number of boxes one would expect from a 2000 square foot, 3-bedroom house and 2-car garage." "Well, in that case," the office said, "we'll have to probably send 3 guys instead of the usual two." Four guys showed up quite late on the 5th, packed and wrapped like dervishes, but quit about 5 P.M., promising to be back, "Oh, not later than 8am ... probably earlier." We still had to number and inventory all of the day's work and we kept at it until after midnight. THE BIG DAY: The movers dragged their sorry butts back to "the scene" after 8:30 that morning, then stood around sizing things up and chatting for another 10 minutes. There was still a lot of stuff to be wrapped in mover's blankets and nothing had been moved out to stage it in the driveway. Of course, the 40' sea container arrived at exactly 9 A.M. Expecting difficulties, Pat had enlisted the help of our friend, Harvey Foster, to act as a monitor and third set of watchful eyes. As you can see from the adjacent photo, their "professional" means of getting everything from ground level up into the container was via strong backs or the S-L-O-W lift gate on the back of their rented Enterprise box truck. Immediately, someone on the crew mumbled, "We can't do this in 3 hours -- more like all day." Uh-oh. Then came the first extortion. 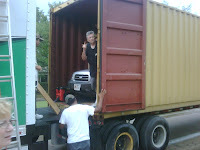 Based on what several professionals had told us and just on the visual of the sheer mass of stuff we were going to try to put into the container, we knew that it would be hard to fit everything into that container, especially with a car taking up a lot of space. want to use it, shaking his head that it would be a waste of time. Great. $200 of lumber and 4 hours working in the sun to prefabricate it and he was going to blow it off. Some time around 3pm, Mr. Genius, the loader, realized that he really wasn't going to fit everything in. Almost like the thought he could sneak my deck into the container without admitting he was wrong, he sent his two laborers to get the support pre-fabs without a word. Then he realized that they didn't have the screws or tools to put the decking in place. But first, (in Spanish and with much hand waving) "Have them put the car in first." What?!? We had arranged for a tilt-bed wrecker truck be on standby to lift and raise the Subaru up into the container's deck height. On standby. "Give us a half hour's notice." Mr. Genius, I guess, thought that we were going to levitate the car up into the container. Where's Harry Potter when you need him? Called the wrecker dispatcher, expecting to get a refusal for such instant service but he gave me the first good news of the day, "I'll have him on his way right away." Super. Their dispatch yard was less than a mile away. Just then, there was a clap of thunder. Ominous clouds were racing in overhead. Everyone scrambled to get things up inside the Enterprise box truck and out of the exposed driveway. Just as the wrecker arrived, the sky opened up with all the rain we had been waiting for since this past February. All of it. At once. The driver jumped out, got the low down, and told me to bring the car into line with his bed. Hook, snap, buzz and I'm sitting in Subie, 4 feet up in the air, completely blinded by torrential rain. Everyone ran for cover. As the rain let up a little, I could see a concerned little confab going on among the movers. Rolled down the window, a little, "What's wrong?" "The wrecker's bed is about a foot lower than the container's." Crap. Now, I'd been assured by this wrecker company's office that, "Oh, yeah, we do these vehicle loading-into-a-container jobs all the time. Don't worry. Nothing to it." What now? Then, I noticed my 3/4" thick plywood hurricane board-up "shutters" sitting up by the garage. Four of them. 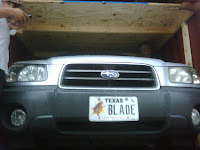 I reasoned that creating a ramp by stacking two sheets behind each wheel -- 1.5" of plywood -- would certainly support a little Subaru. I shouted this out to Patricia, The Translator, and Da Boyz jumped to the task. As soon as the lumber was in place, bridging a 1-foot height difference and about a foot of distance between the two vehicles (an abyss into which I could fall if something went wrong,) everyone but the wrecker driver ran for cover from the rain. 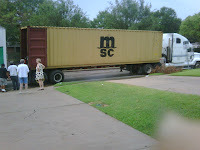 The wrecker driver motioned for me to back into the container. I didn't want to spin the wheels and shoot plywood down the street so I began to move gingerly. As I got to a point which I guessed to be directly over the abyss, the driver's eyes popped out of his head, communicating a need for urgent action. I floored it. And slammed on the brakes. Plain and fancy driving if I do say so myself. Perfectly centered and only about an inch or so out of linear position. I'm told that my plywood sheets had bowed under the weight of the car and then emitted cracking sounds. Glad I couldn't see it or we'd have spent another hour cleaning up the driver's seat. Quickly, with me supervising from within the container, the pre-fab decking was muscled up into place and my screw shooter was used to hold everything down in place. Loading resumed. Gosh. Now they had PLENTY of room to finish the load out. Judging from the body language and the grins, the "pros" were congratulating themselves for being so clever as to use my decking. Cripes. Just then Susan Gallivan showed up with a huge bag-o-burgers-n-fries to save our day. We hadn't eaten since about 6am and were a bit more than famished. THANK YOU SUSAN! The rain quit. The loading was completed. Container papers signed. Ready to roll ... not. "Where's your container lock?" says the loader. 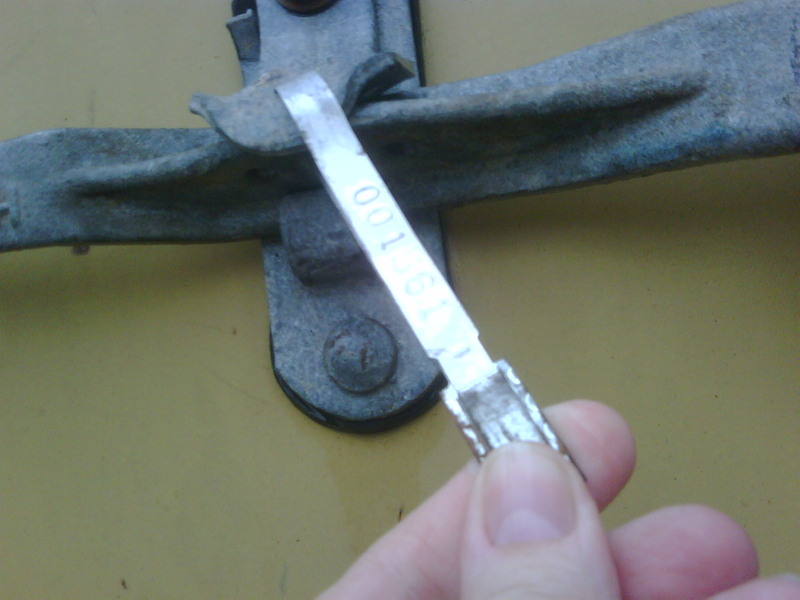 "No lock ... we're using a customs seal ... this is an international ocean shipment." "You gotta have a lock. Company policy." 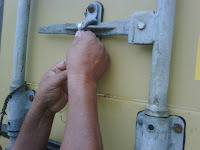 "If we lock it then Customs won't be able to get in and survey the load; and, anyway, all of my locks are packed. 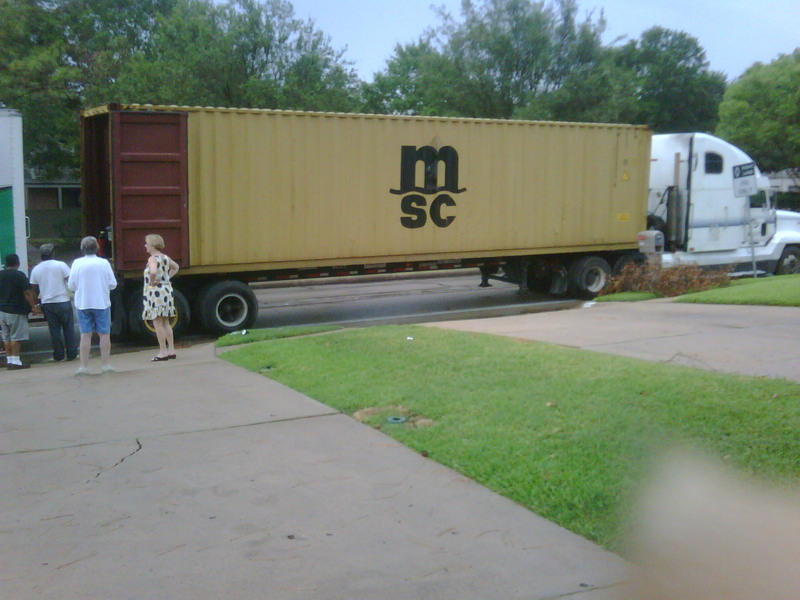 They're inside there (motioning to the container) somewhere." Just about now the container rig driver stepped into the fray telling the mover's loader that, no, we don't lock these shipments. The truck driver looked at me ... I looked at him and jerked my head, as in, "Go ... now." So as our worldly possessions rolled off out of sight, the loader was on his cell phone chattering excitedly to his office. What was he going to do chase after the truck? He hung up. Nah. He was going to come at me with yet another demand for more money. "Ya know, we only allowed 4 hours for this job so you're going to have to sign for 5 more." And I'd just given away all of my guns. Patricia to the rescue. Ever seen her REALLY mad? In Spanish? I didn't know what she was saying to this guy but she was scaring me as well as everyone around us. That was the end of it. The movers picked up their junk and slunk off to who knows where. Probably to some other stupid victim's house to extort double the quoted price from them. I sure wish I could do this moving thing at least once a year. I just don't get enough stress anymore. Omigod. We never got to ALL the sorted details at dinner. YIKES what a horrible day for you. Thanks for taking the time to give us the lowdown. Oh my gosh. What a stressful operation! You sure hid it well while you were here (sorry you made that trek, I should have come to y'all and helped pack!!). Glad you're there and resting now.